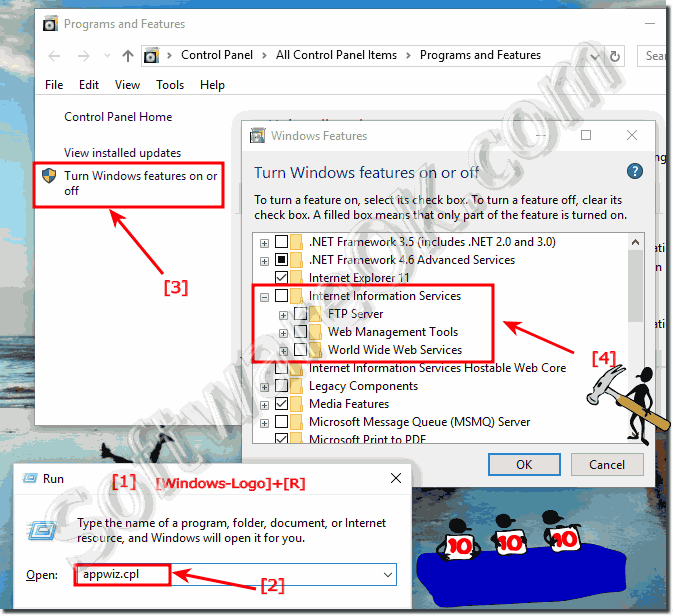 An simple example how to activate IIS Web Server or FTP Server on Windows 10, this solution is also for Windows 8.1 and Seven! If you want to activate or deactivate FTP or WEB Server on Windows-10, please use the Windows-X Menu and turn it on or turn it off over program and features in Windows 10 ! And enable the Features: (... see Image-1 Point 1 to 4 ) about the Command appwiz.cpl! ► Run Windows 10 command prompt (cmd.exe) in administrator mode! ► Use own image for the desktop background in Windows 8.1 and 10! ► How can i force move or copy of the data while dragging? (Image-1) HTTP FTP WEB Server on Windows 10! Internet Information Services is the web server software included with most Windows and also from Windows 10 PRO. You can also install a web server to serve dynamic content! File Transfer Protocol (FTP) extensions are now integrated into IIS 8 and can be managed using the IIS Manager on Windows 10. The File Transfer Protocol is a protocol used to transfer files and folder over the Internet. People commonly use File Transfer Protocol to make files available for others to download, but you can also use File Transfer Protocol to upload personal webpages for building a website or for putting images on a picture sharing site. Windows-10 - FAQ-181: Activate Web Server on Windows 10 for HTTP or FTP, how to?